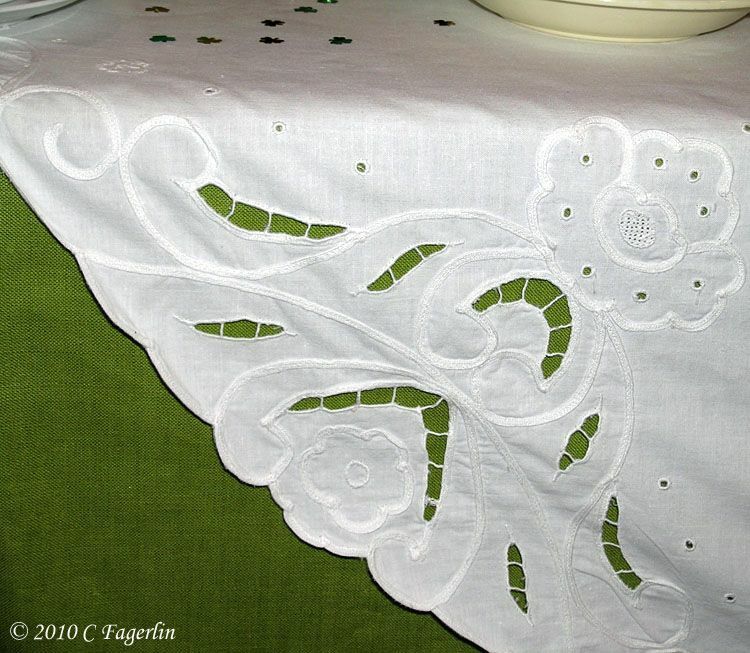 Be sure to stop over at BNOTP to see all the wonderful tablescapes for this week! loved it, so this is my chance to finally use that wonderful name. 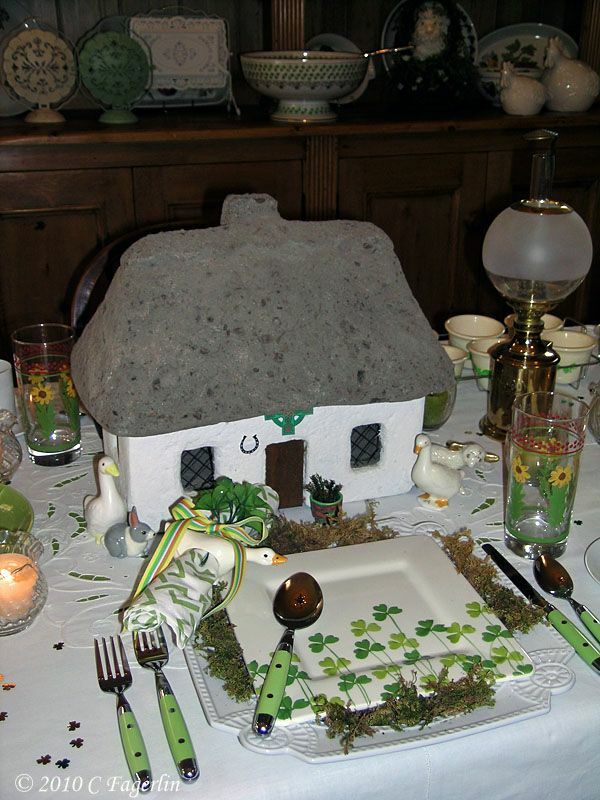 not corned beef, was the traditional Irish meal. 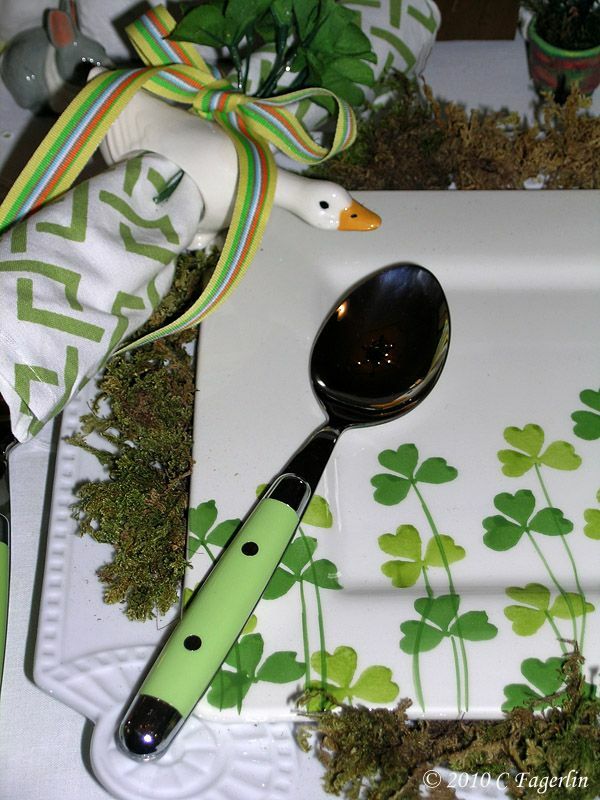 Flatware, napkins and shamrock plates from Home Goods. 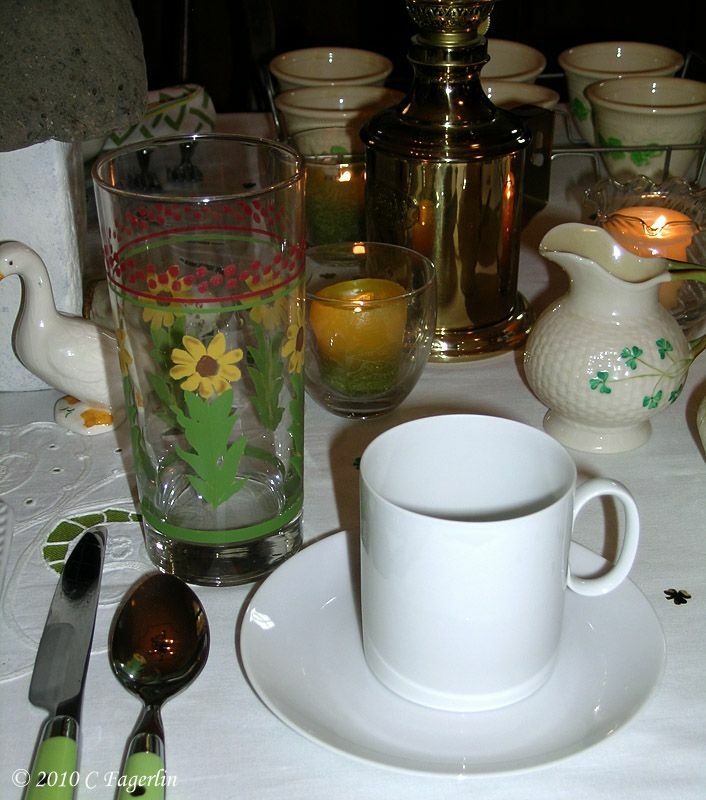 Rosenthal "Medallion" china tea cups, sugar, creamer and tea pot. 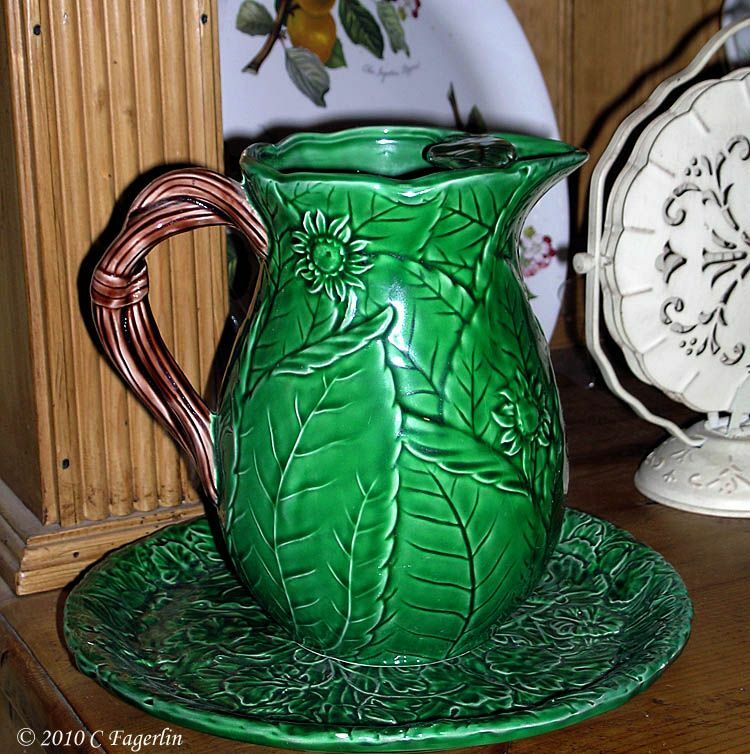 by Homer Laughlin China Company. 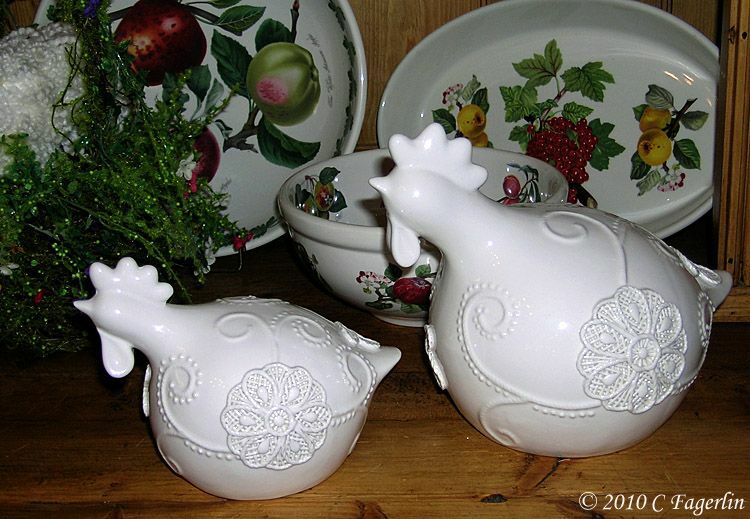 Vintage Homer Laughlin shirred egg plate from the Oven Serve line. 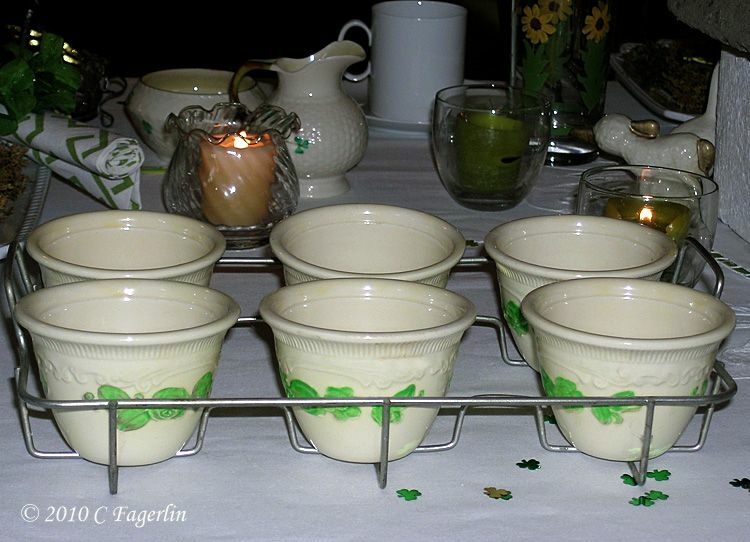 And below are the custard cups from the same line in their vintage wire rack. Lantern was a souvenir from the Virgin Islands. 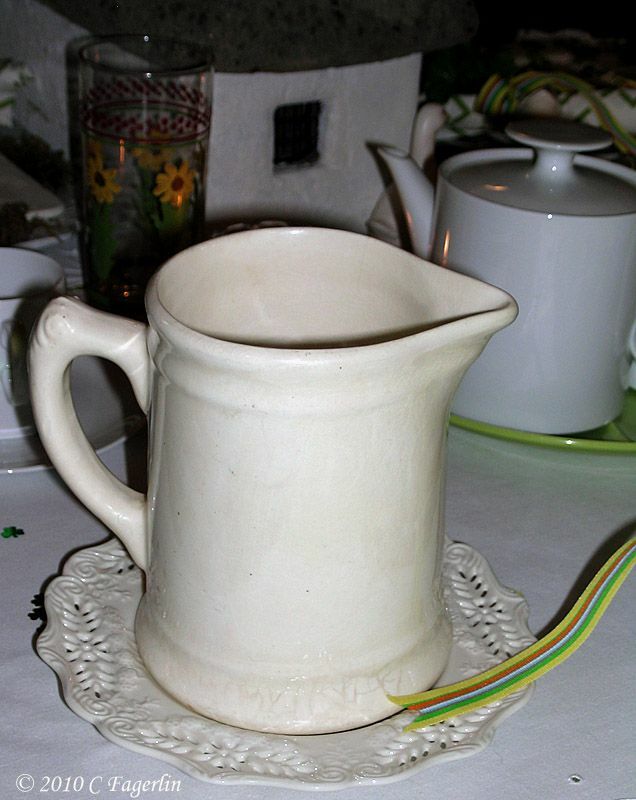 Vintage Homer Laughlin ironstone milk pitcher. 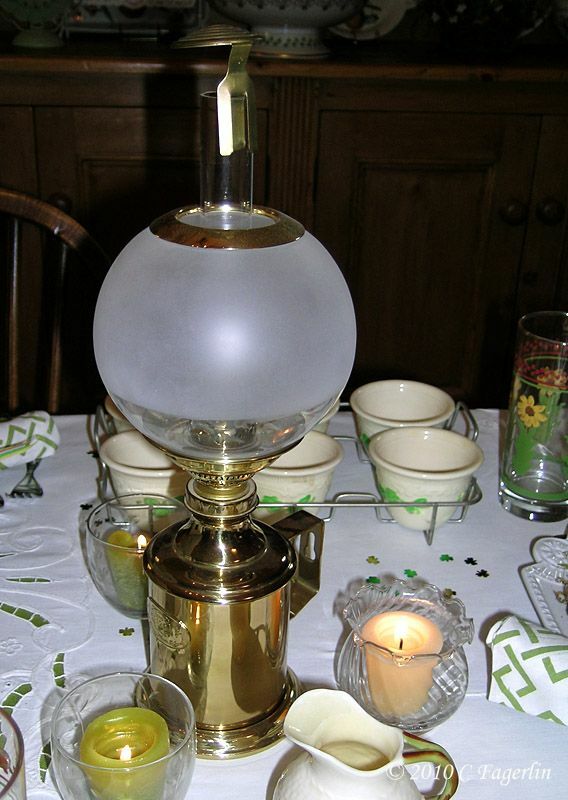 then add a glass plate for things like shrimp or devilled eggs. 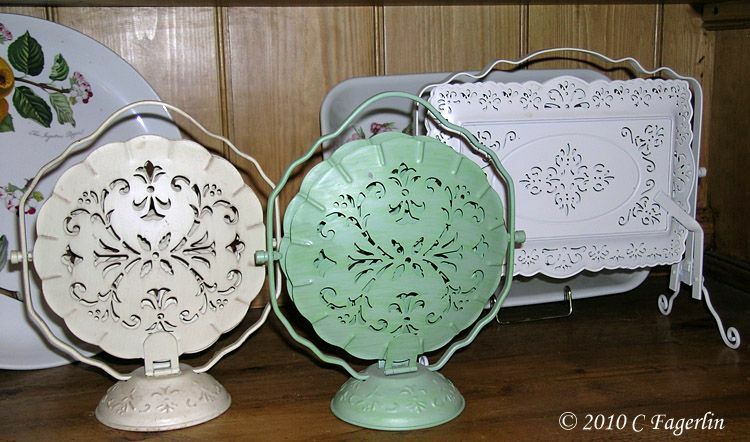 Reproductions of vintage folding cake/sandwhich trays. Place unwrapped bacon in 5-quart pot of cold water; bring to a boil and drain. 25 minutes per pound of bacon. for last 20 minutes of simmering time. Remove bacon and chop into small pieces. 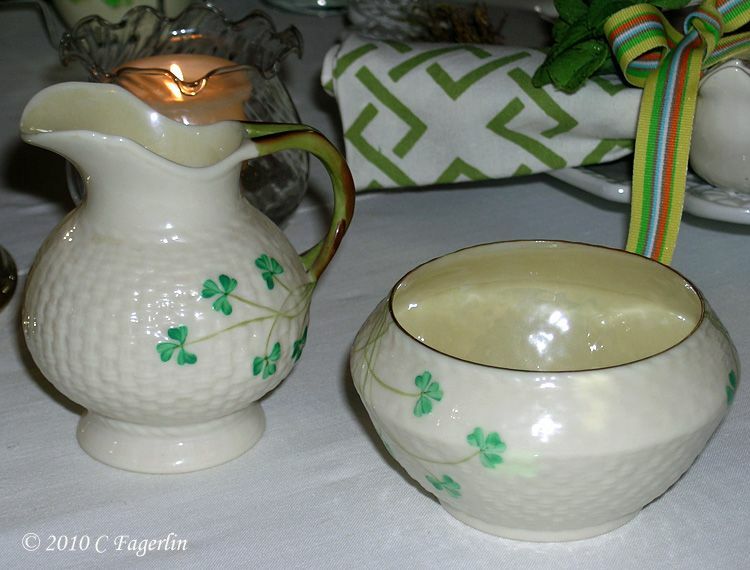 butter together, and serve with a side of boiled potatoes for true Irish fare. Charming. 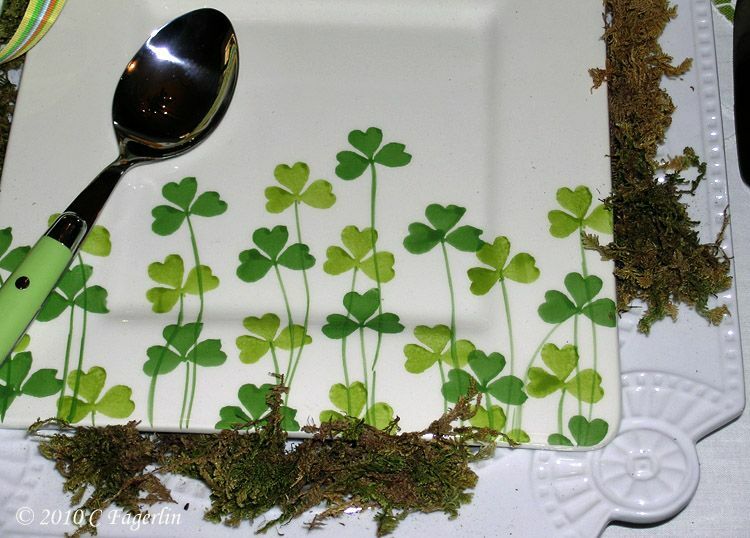 I just love the shamrock plates with the moss-covered background. Such a creative lady you are. I, too, had a veto-ing husband. Was yours as short on his own suggestions as mine? Sheesh! 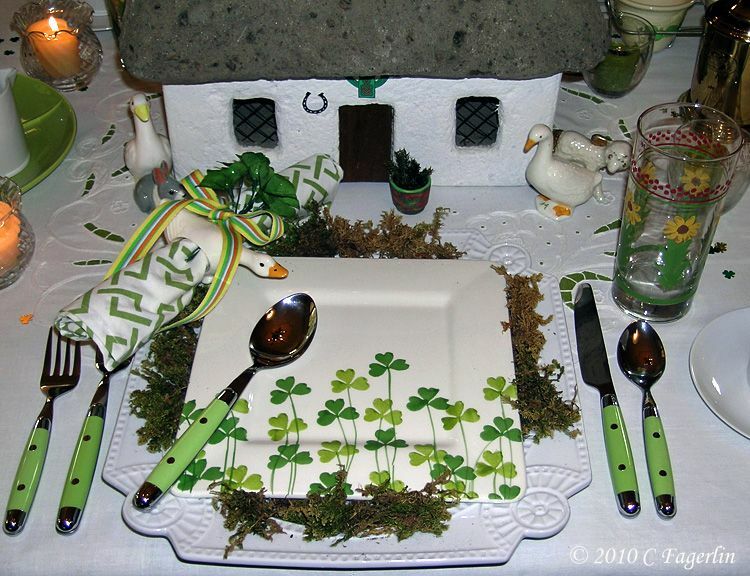 This is so so sweet..Your shamrock plates are just precious. 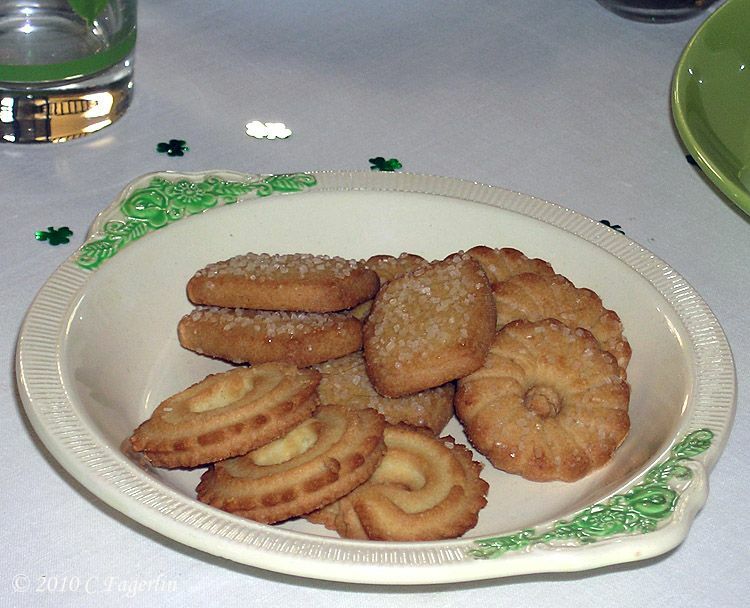 I hope you link this up with CUISINE KATHLEEN'S St. Patrick's Day party on the 16th...It's just perfect. Your tables never disappoint! Beautiful punch bowl. 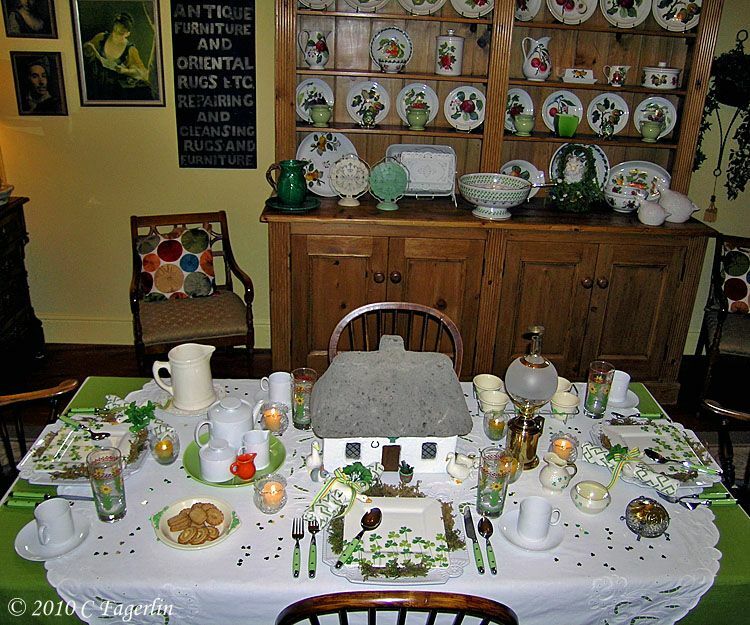 Love all your St. Patrick's day dishes and the cottage -- Everything looks quite grand for the big green day. 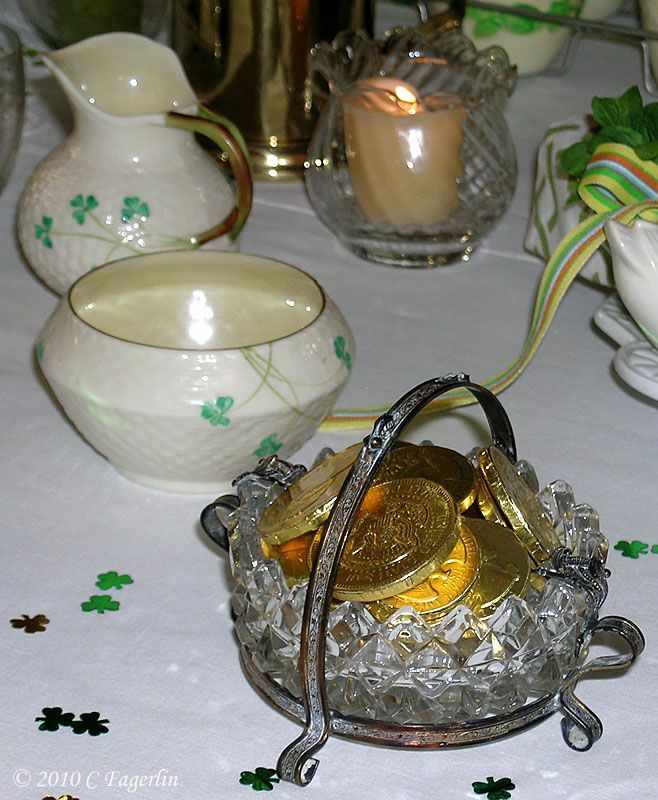 You have a wonderful Irish collection! 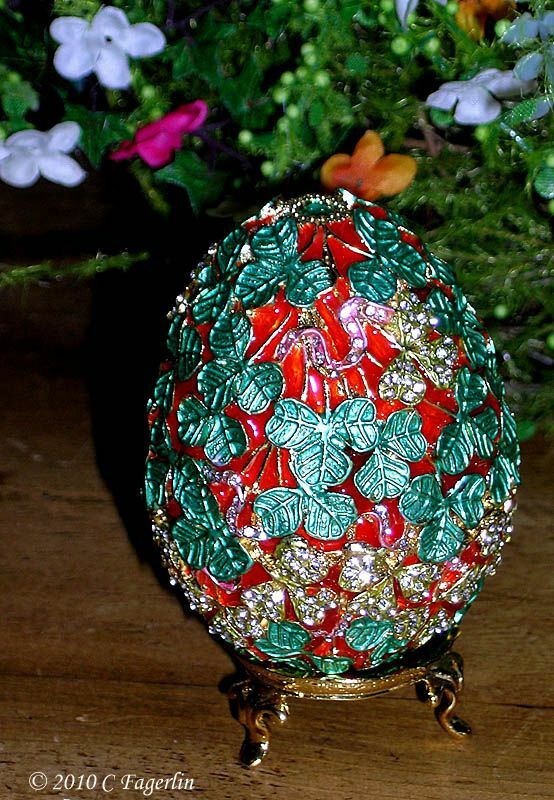 You are so festive for St. Patrick's Day! All decked out in your finest green! 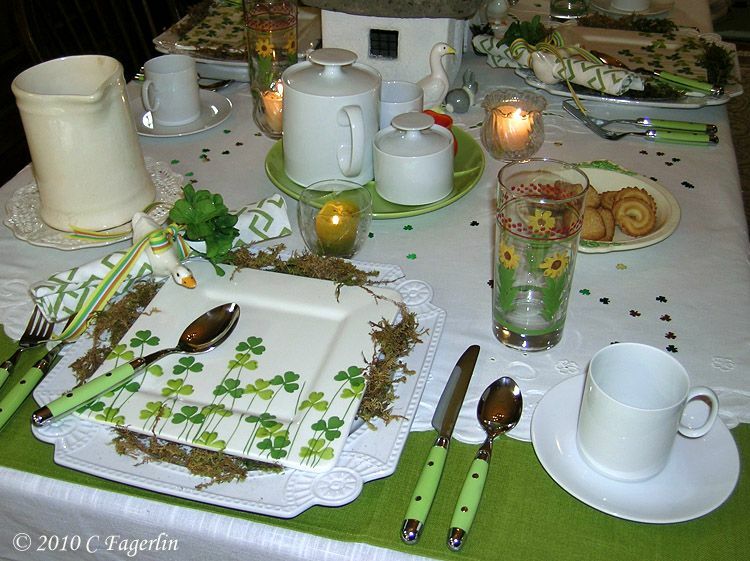 Love those plates with the shamrocks, and I spy a set of napkins I almost bought, too! Did you get yours at Home Goods? I ended up using some I had, but seeing yours, I want to go back for them. 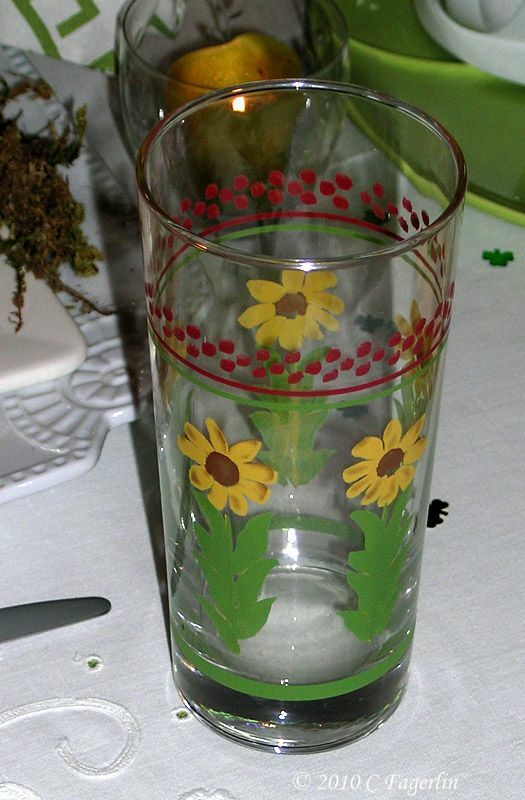 I got them in yellow, though. Same pattern. 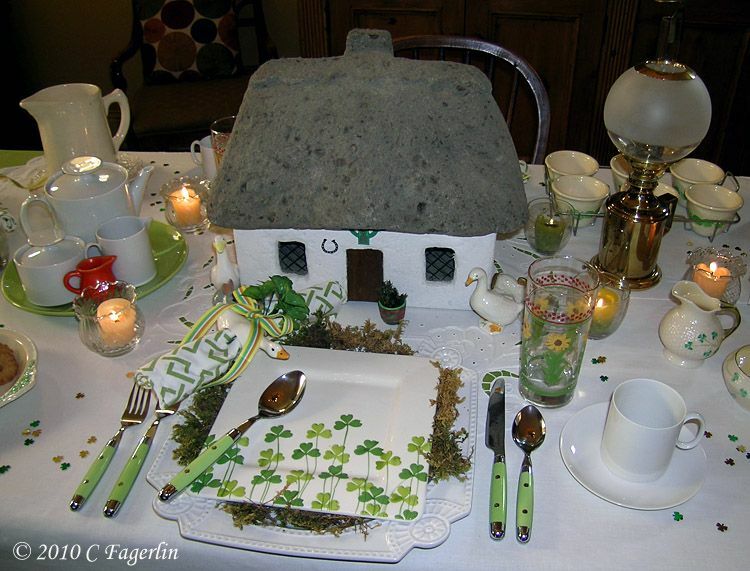 Love your Irish cottage... so cute! 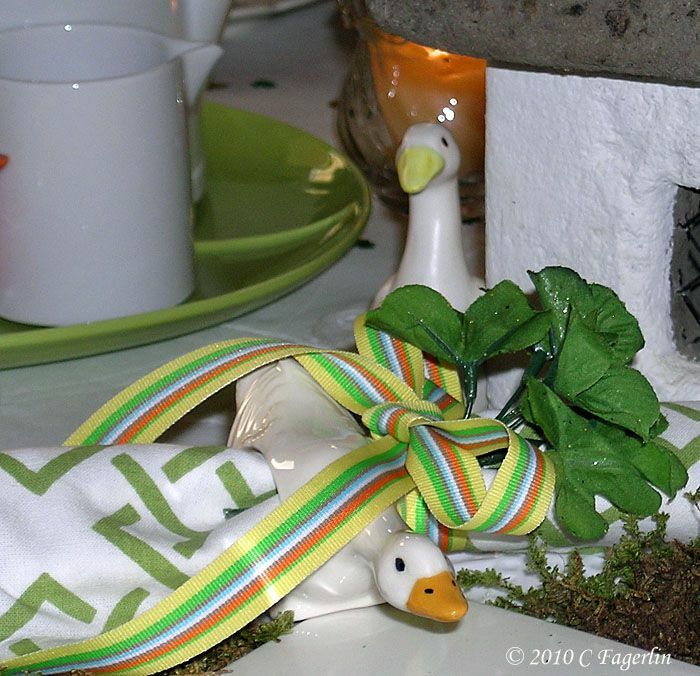 And all of the little ducks and things on your table. Very cute 'scape! Love that cottage!! The square plates are wonderful, too. Your table is just fabulous. 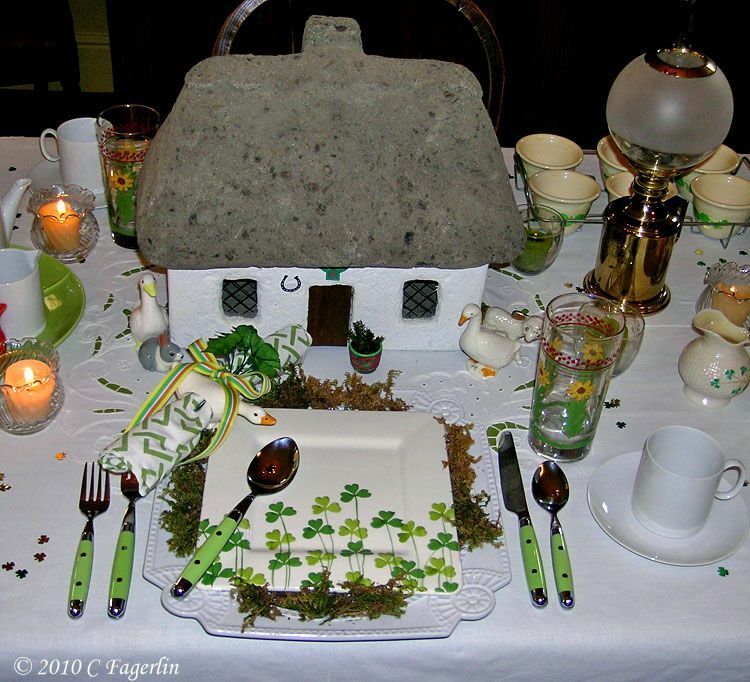 And Early Happy St. Patrick's day to you!! bj - you bet I'll see you for the party at CUISINE KATHLEEN'S ! Sheila, I did get my napkins at HG! Thank you all for stopping by and leaving a comment, I do appreciate it! 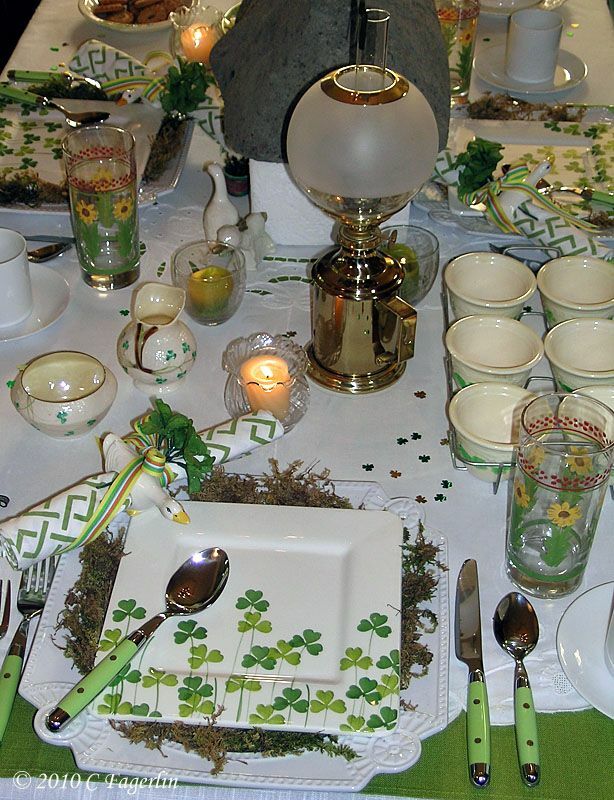 I'll have another St. Pat's table at Kathleen's Party to share. Wonderful, wonderful, wonderful. I hope to join your Thursday party soon. Since I'm so new at linking and getting my post ready on time I missed my window of opportunity this week. I love to look at your blog and I have put it on my favorite blog list to check everyday. Candy, love your attention to all the little details. 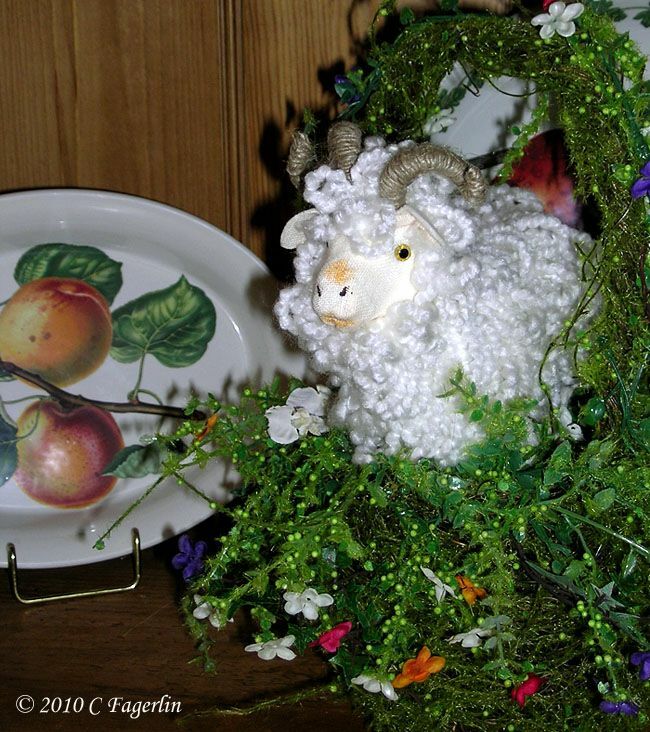 Love Moira's cottage, the sheep, the plates, the Belleek - great table! Candy, I just discovered your Happenstance Garden blog and wanted to let you know I left a comment on it, and can't wait for updates! 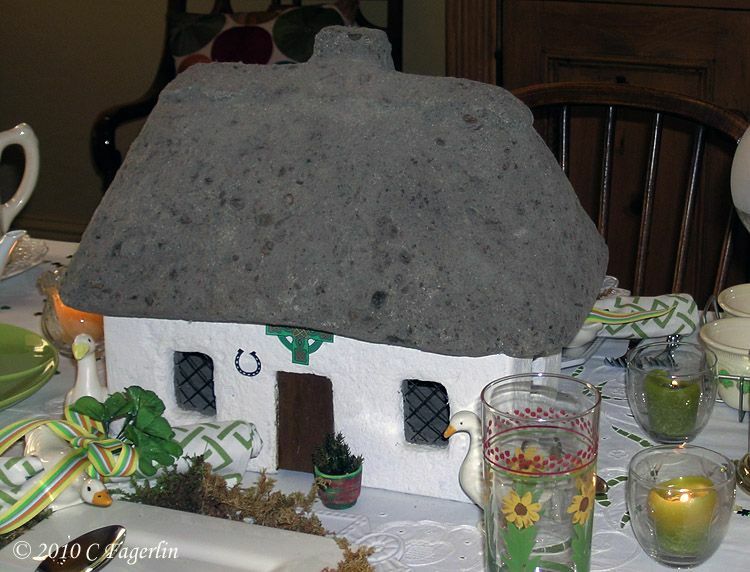 What a cozy cottage table! And with a Homer punch bowl supervising it all! Thanks everyone! 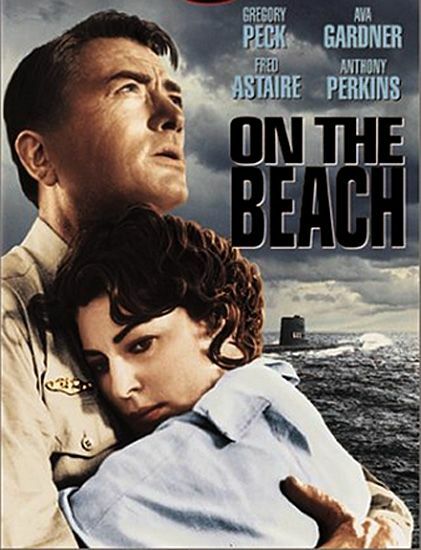 It was a fun one to put together and I think I need to go rent On The Beach to watch again after all these years. Beth - I do intend to get back to the Happenstance Garden blog (when I first started blogging in Aug 2009, I set up the 3 blogs.....what was I thinking, I'm having a tough time keeping up with them all! )I've been very remiss in not getting it up to date and here it is gardening season again. I'm still 2 years behind in posting pictures, but I will get to it and then start fresh for 2010. I had to laugh as I visited the post you commented on.....I had dated it "1007" instead of "2007" .... I would never catch up if that were true. LOL I also had a couple of dates wrong that I fixed for when things happened, it's tough getting OLD!! Hi Daphne! 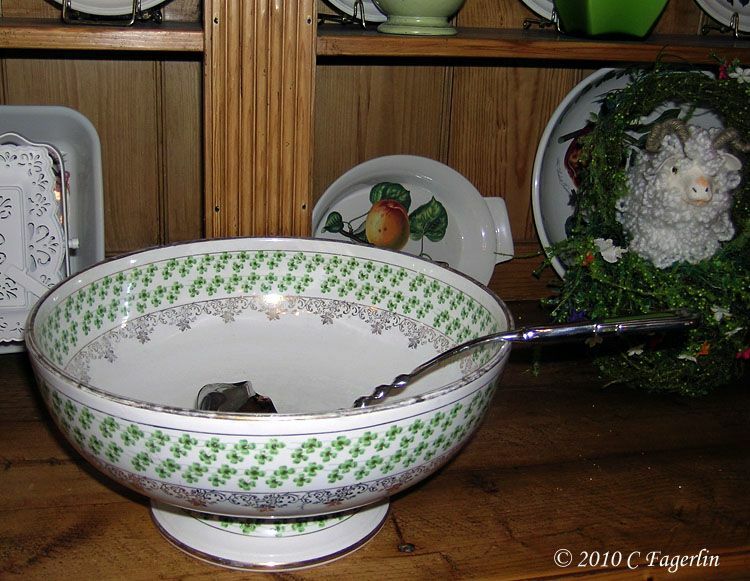 That is my favorite of the 3 or so Homer punch bowls I have ..... just love the shamrocks!! Wonderful table! 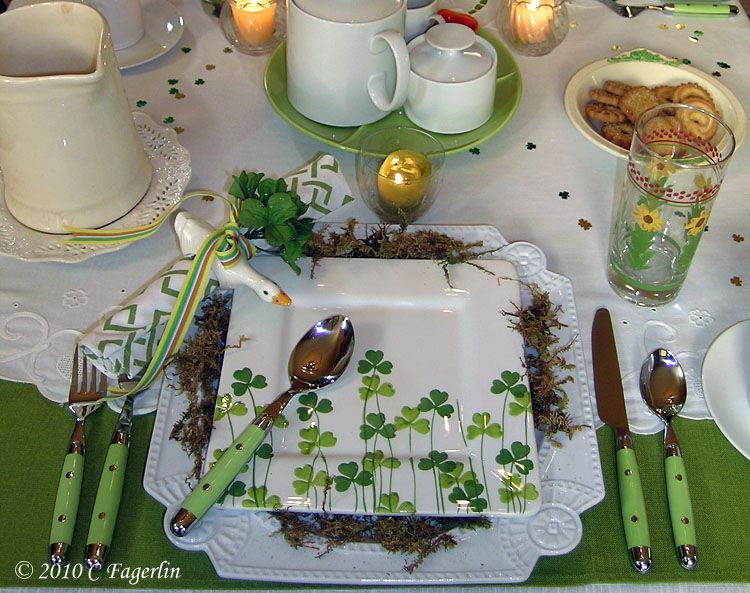 Love the shamrock plates and the napkins! Great job! So many beautiful, colorful elements, and your attention to detail is always impressive! I loved seeing Moira's cottage (and I agree it's an unusual, very special name!). Oh how fun! Great job!! Happy Blogging! Thanks again for stopping by, I do so appreciate your lovely comments! Bill - I haven't used this name for the last time...perhaps a new cat or dog will be christened with this name! Hello Candy, I came across your blog while reading up on the 2010 Housewares show. 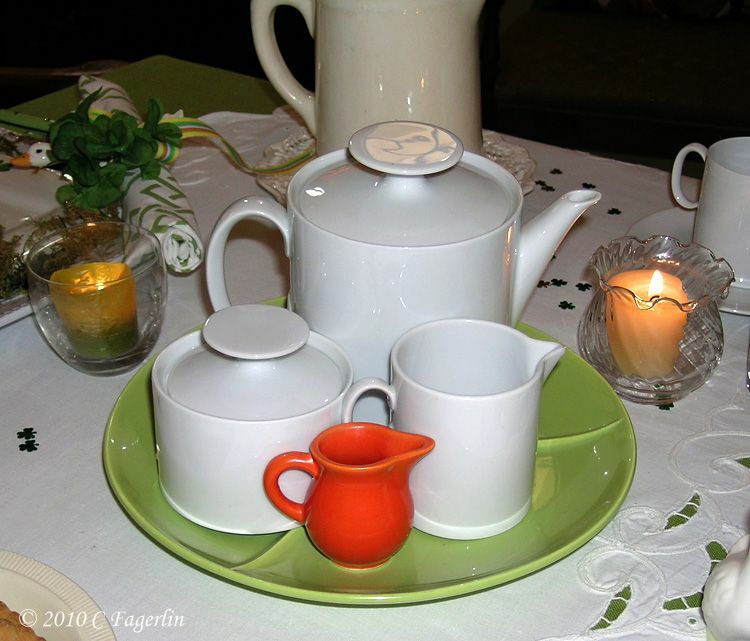 You have a beautiful collection of tablewares. I do have a question, did you make Moira's cottage? I just love your cottage. 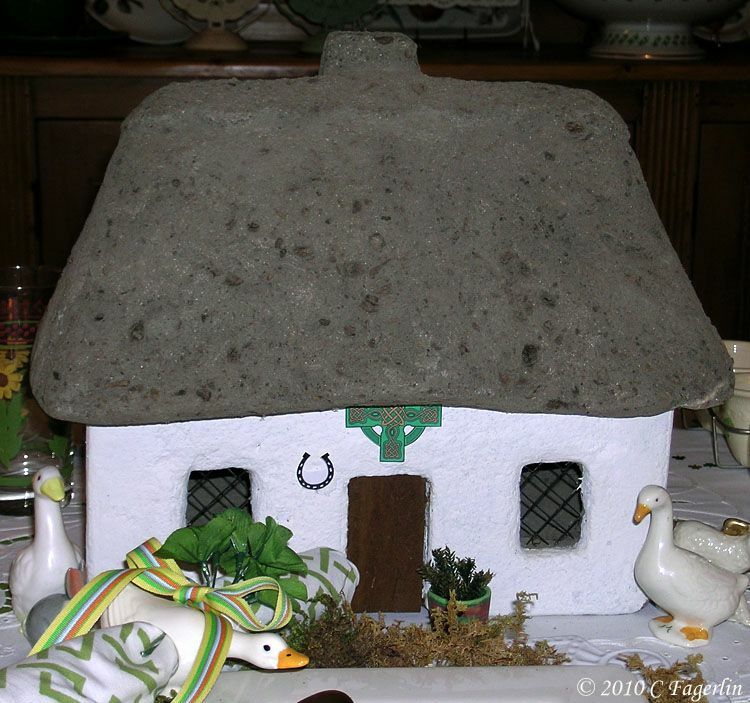 It looks very similar to the houses that my relatives live in,in Ireland. If you didn't make it, where did you buy it? I would love to add it to my collection. Happy St. Patty's Day!!! Great Erin! Let me know if you do choose one, I'd love to hear about it.